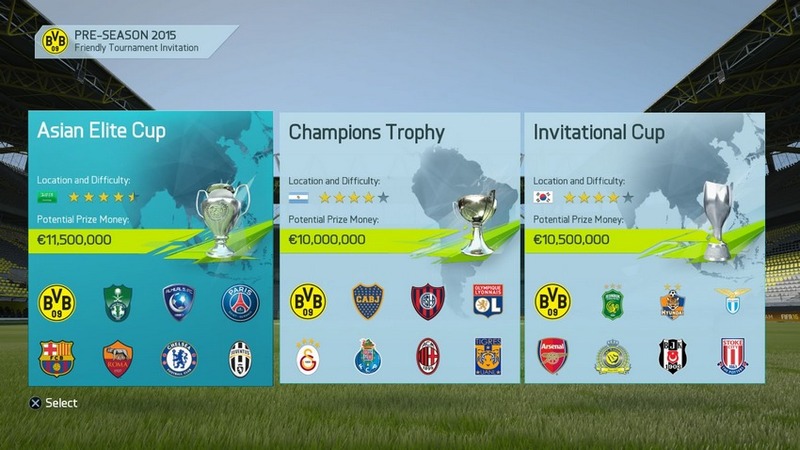 In FIFA 16, we are introducing this key development period to Career Mode. Prior to a given season, your club will be invited to three out of a possible nine tournaments, played in Asia, Europe, North America, or Latin America. Career Mode in FIFA 16 delivers two of our community’s most requested feature updates and many other key changes. During the summer months, all the major clubs travel around the world in preparation for the upcoming season. Just as with real football clubs, these matches will be a great opportunity to work on your team tactics and line-ups before the start of the regular season – use all your subs to test squad players. The prize purse from these tournaments gets allocated to your transfer budget for the upcoming season. A footballer trains between matches to improve as a player. In FIFA 16, managers will be able to train their squad to increase player attributes and boost player development. Each week, select up to five squad players to train from a number of training drills, each focused on developing specific attributes. The aim here is to allow for greater growth in youth squad players and to create more value to the club. Focus on your star players to keep a strong starting XI, develop youth players to increase transfer values and build your funds, or transform your club into the next Ajax or Barcelona, a breeding ground for the future stars of world football. FIFA 16 will fully immerse you in the story of your club’s season. Our commentators will remark on key storylines, including notable player or team performances, big player debuts, and transfer rumours. In-game graphics and commentary will also pick up on interesting team stats for matches, and reference the wider context of league standings. Sign free agents outside of the transfer window. Scout Reports – After scouting a player reports are available to you now for an entire calendar year before expiring vs three months in FIFA 15. Transfer Budget -Transfer budgets are now more realistically tailored to the club you’re using in Career Mode. Also, a percentage of the remaining budget from the previous season will carry over to the next. and will vary based on where your club finished in regards to season goals. Loans – Short loans have increased from three to six months and there is now an option to issue two-year loans. Friendly Subs – You will be able to issue an unlimited number of substitutions during friendly matches. More Realistic Transfers – While the transfer window is open, we have tuned the number of ‘high-profile’ moves by big players to better match the number of changes that typically happen in the real-world. Improved Player Transfer Values – We’ve addressed values of players to better match the real-world transfer market.